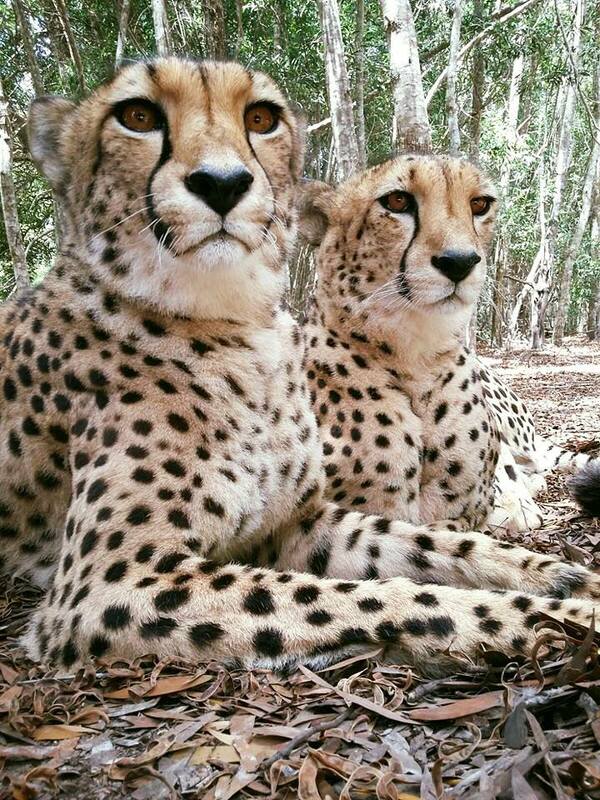 Male Cheetahs, despite being territorial are sociable and you may find them in groups called coalitions. Females prefer to live a solitary existence and if they have young you will find them with the mother. Cheetahs are known for their incredible sprint when giving chase. Accelerating from 0 – 100 Km/h (62 mph) in a matter of 3 seconds and reaching top speeds of up to 120km/h(75mph) they are the fastest land animal in the world. Like a racing car, it is built for this sprint. Semi-retractable claws leaving a section constantly exposed adding traction. A massive lung and heart capacity. Nostrils aligned in such a way that when their body is in the sprint position they allow for air to flow straight into the lungs. A slender aerodynamic body with a thick, long and heavy “rudderlike” tail acting as a counterweight enabling it to turn and outflank its prey. At top speed, their strides can be between 7 - 8m apart with a frequency of around 4 strides per second! No wonder high performance motor manufacturers like to compare cars to cats. The cheetah is equipped with turbo-like features.